Happy New Year to all of my awesome readers! It's been too long since I wrote a personal post so I figured with the New Year I will (try to) post something weekly that has to do with me personally. Since it's a New Year I have also decided to make some changes on One Mom's Moxie. I have big plans for the year ahead and want you all to feel free to send me suggestions, products you would like to see reviewed or even certain product in a giveaway. You can email me at OneMomsMoxie@gmail.com or send a message to me on Facebook. I hope you all had a safe and wonderful New Year. I spent mine with my family. My girls and I painted nails, played games and ate brownies. It was nice to have some family time. Unfortunately I woke up sick on the first day of 2013! I am not letting it keep me down though. 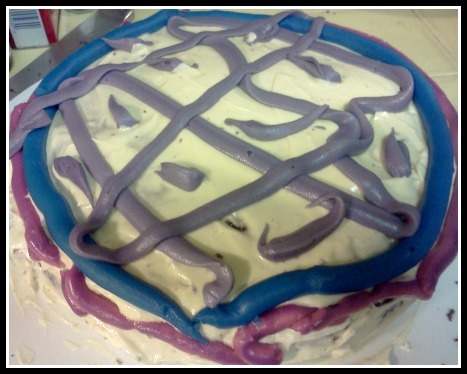 My daughter and son made a cake (see above) and I wanted to show off their baking and decorating skills. It was very sweet and yummy! Well, keep an eye out for the weekly flash giveaways from the great group I am a part of called Pay It Forward. There is a flash giveaway at least 3 times a week, sometimes more. And please bear with me as I make changes to the One Mom's Moxie page. it's time for a new look! Thank you all for your support and reading One Mom's Moxie, I truly appreciate every one of my readers!